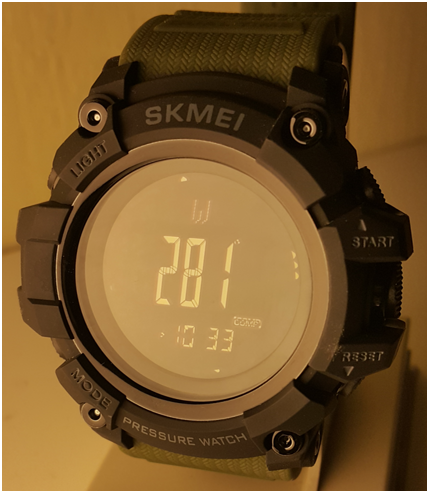 SKMEI 1358 compass mode display the direction of the watch is facing in form of N, S, E, W and also in form of bearing degrees relative to North. Keep reading to find out how you can setup the digital compass and calibrate it. 1. From the main screen, press the dedicated Compass button to enter compass mode. 2. Press and hold the MODE button to enter compass setting mode. In the setting mode, you can cycle through two types of settings for compass mode using the MODE button. 1. Cycle to CAL screen and press either the UP or DOWN button to start auto calibration. 2. Grab the watch by the strap and move it in the figure of eight horizontally slowly until the auto calibration complete. Expect around 30 seconds to complete. After completion, the digital compass is set to point to magnetic north. 1. Cycle to DEC screen and press either the UP or DOWN button to set the angle correction to the compass. The maximum angle correction allowed is +/- 90 degrees. 2. Press and hold the MODE button to apply your change. This calibration is useful to set the digital compass to point to true north. While in compass mode screen, press the DOWN button to exchange the north and south direction. Thank you for visiting Almost a Technocrat. Due to many spam comments, your comment will be moderated. This city codes are provided in the watch user manual but for the ease of references in the web, I put this table in this blog in case i wanted to refer to it using my smartphone. Hope you find this useful. 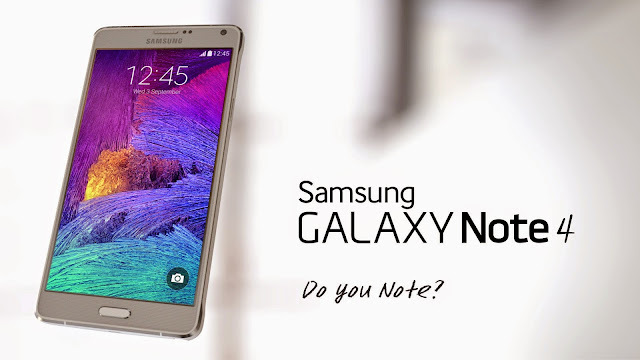 This is how to enable Samsung Galaxy Note 4 to force use only 4G (LTE) network connection for high speed internet data. There is a built-in switch in the smartphone that will enable the smartphone to force use only either 3G (WCDMA) or 2G (GSM) network connection but, there is no switch at all to enable the smartphone to force use only 4G (LTE) network connection. Ever wonder how to start an individual desktop session with VNC? Below are the steps on how to modify the VNC startup script to start the GNOME desktop prior to the login user who started the VCN server command. 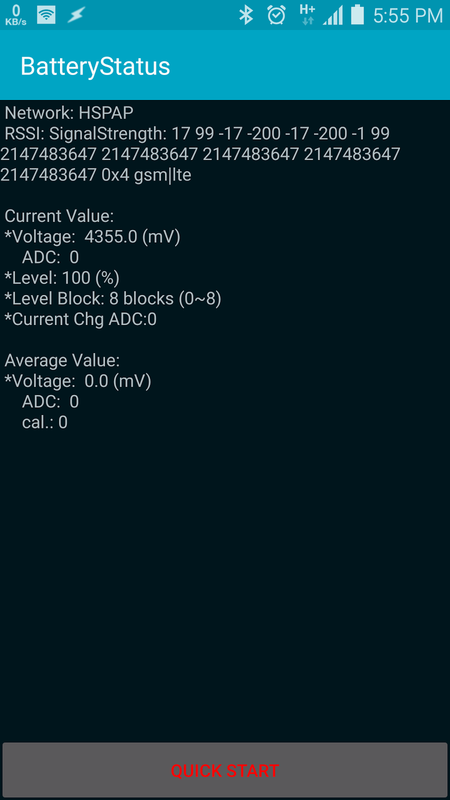 After more than year using the Samsung Galaxy Note 4, I have notice that the battery life seems to be deteriorating. The phone shut down at around 20% of battery level. I was thinking of buying a new battery but I remember I read somewhere on the internet that the battery can be recalibrated to restore the correct reading. That would be the first thing I should do before I decided to get a new battery. 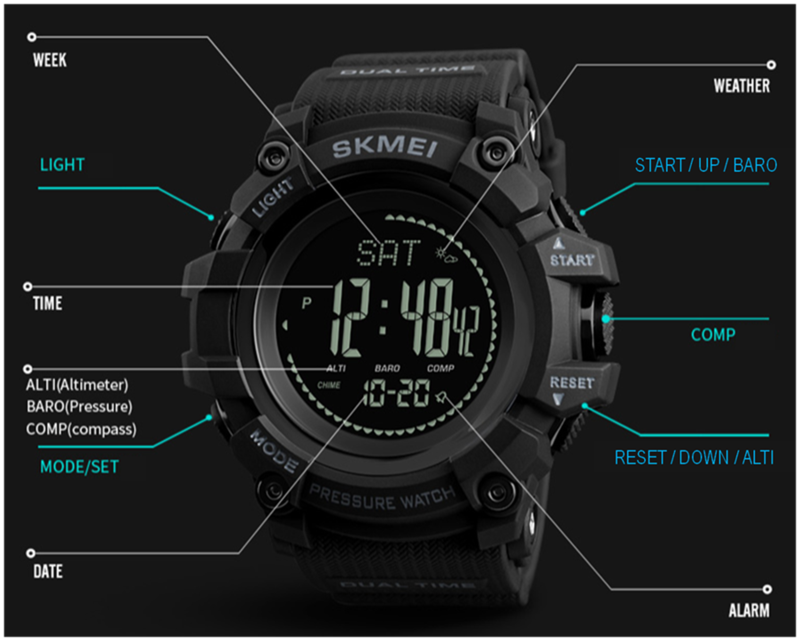 This SKMEI 1358 digital watch is a great watch for a really cheap price. However, the instructions manual is far from good. It took me some time to explore some of the functions and at the same time trying to understand the instructions manual provided by SKMEI. I decided to write an alternative instructions manual for this watch so that other owners of this watch might benefit from it. But never the less, I am not a good English language writer myself. But I do think it is still better than the instructions manual provided. Feel free to correct me using the comment section. Tasker is a very powerful Android smartphone automation application. Although Tasker can practically do anything you want, you still have to learn how to create the automation. I know many of you out there are just plain lazy or no time to pick up the skill. Many had relied on Tasker users shared automation projects, profiles, tasks or scenes to quickly kick start your automation without hassle. I am sharing most of my Tasker automations in this blog for the benefit of the lazy Tasker people (no offence, i am one of them too). The Tasker automations that i am sharing in this blog are just the exported xml files. Most probably i will not be writing the "step through" like some other websites did but you can download and import the xml files using Tasker. It's easy enough. You can tweak my automation to suite your need. This post will show you how to import Tasker automation xml files into your Tasker application. 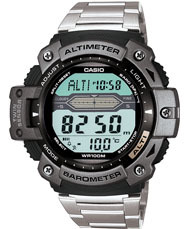 This SKMEI 1418 / 1427 digital watch is a great outdoor watch for a really cheap price. However, the instructions manual is far from good. It took me some time to explore some of the functions and at the same time trying to understand the instructions manual provided by SKMEI. I decided to write an alternative instructions manual for this watch so that other owners of this watch might benefit from it. But never the less, I am not a good English language writer myself. But I do think it is still better than the instructions manual provided. Feel free to correct me using the comment section. 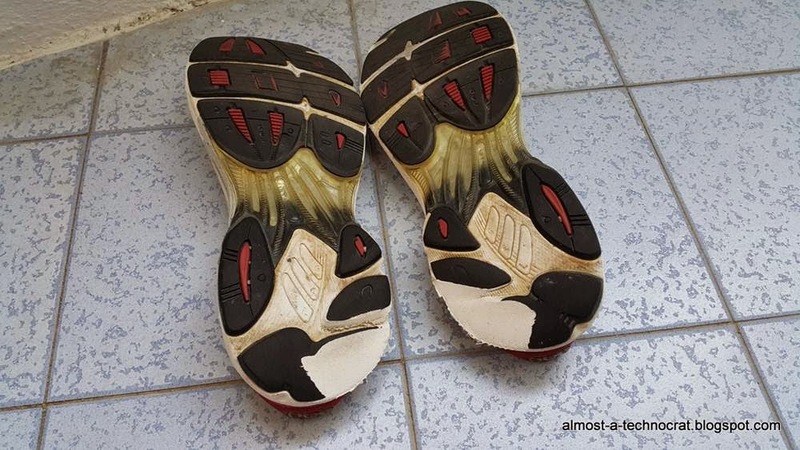 This is an attempt to give my 3 years old pair of ASIC running shoes a new life by re-gluing the sole and also fixing the worn off heels section of the sole. I could throw away this old pair of running shoes but it would be interesting to see if I could fix them and re-purpose them for other uses. 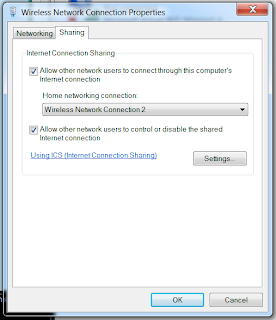 This is how you can create a WiFi repeater or extender access point (AP) using Microsoft Windows 7 operating system without using any 3rd party software. This is very useful when you are in an area where internet WiFi access point reception is weak for your mobile gadgets (smartphones or tablets) but not for your laptop or desktop. The WiFi adapters that are built-in your laptops or desktops are more powerful in reception quality compare to your mobile gadgets hence you could use your laptops or desktops as a WiFi repeater of extender for your mobile gadgets.